Forget the vanilla wafers and store bought pudding. Lord only knows what chemical non-sense goes into those things. Try the raw food version of banana pudding with the added richness of almond butter and a little cinnamon kick. Sprinkle it with some nuts & you’ve got a proper dessert in under five minutes. Combine in the Vita-Mix until creamy smooth then pour in the containers you want to serve it in. Chill until set. Top with extra banana slices, spiced pecans, or just an extra dash of cinnamon. 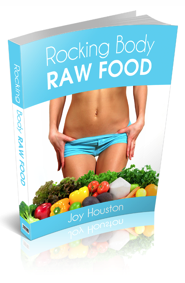 More fast, easy raw food recipes are featured in the raw food detox diet, Rocking Body Raw Food. Take a tour of this weight loss detox program and you’ll see that this 14 day course is guided by your raw food video chef, Joy Houston and includes hundreds of video tutorials, menu plan, shopping lists, and recipes as well as comprehensive training videos and education on the science behind raw food nutrition. If you are ready for a weight loss detox diet that works, tastes great, and involves eating delicious foods and no starvation then this is the weight loss detox for you. What will you look like in your Rocking Body? This recipe has wonderful flavor. I put a portion of it in the freezer and made creamy, luscious ice cream out of it. Later in the day I made your Maca FACA and added about 1/2 c. of the banana ice cream to it for a Maca FACA shake…wow! :o) Talk about rich layers of flavor! My husband was asking for a glass after he took a sip of mine. I’ll be making that again :o) Thanks Joy!